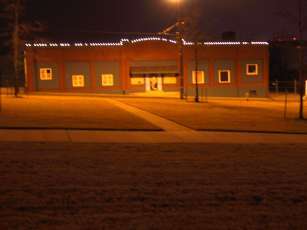 The Warehouse is not a business but rather the downtown Memphis, Tennessee home of Kris Kourdouvelis and Sharon Gray. It is not available for rent to the general public for private parties. Kris bought the warehouse building in downtown Memphis in 1999 and converted it into a home. With a passion for live music he created a large area for entertaining that includes a full stage complete with professional light and sound systems. After meeting Sharon he moved to Memphis full time and in addition to throwing parties for their own guests they began hosting events to promote musicians and organizations that they became involved with. These include singer/songwriter showcases, awards ceremonies and civic and academic presentations for groups such as NARAS, The Folk Alliance, The Blues Foundation, University of Memphis, MPACT Memphis, Downtown Neighborhood Association, South Main Association, The Memphis Flyer and The Memphis International Film Festival. Notable parties have been hosted like The Blues Ball Spring Auction, MIFA's 40th Birthday party/Feed The Soul, The Orpheum's 80th Birthday Party, The Memphis Symphony Orchestra's Opus One, The Garage Band Reunion, Jerry Lee Lewis' 75th Birthday party and Cyndi Lauper's DVD video shoot to name a few. They recently acquired the former Motion Picture Laboratories building at 777 South Main Street and have begun renting office and studio space to companies and individuals in the music and film industry providing an incubator type environment.